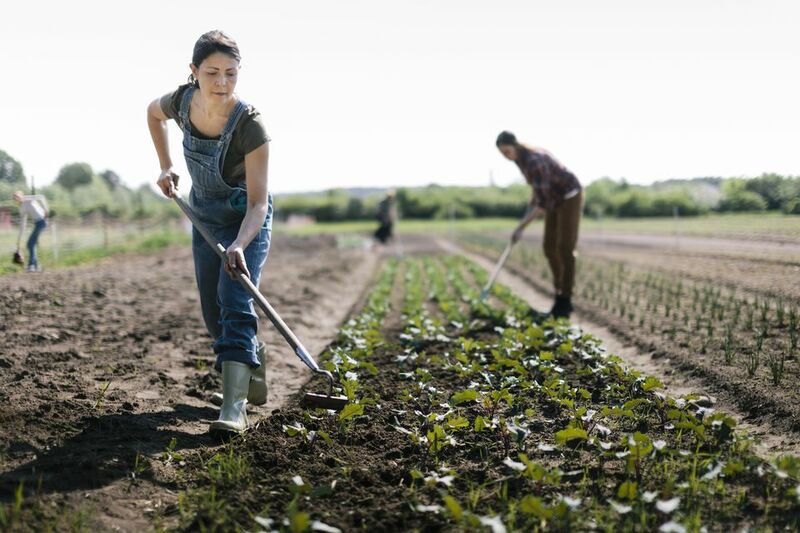 The image of a gardener hunched over his garden hoe, scraping weeds out of the soil, may be cliche, but for a good reason. Hoe's do a wonderful job of keeping weeds at bay, without having to bend down and grab them. There are several types of hoes -- square, wide, V-shaped, bar-shaped -- and they all do the job. You should try out a few to see which you find preferable. In general, a rolled steel blade that is riveted to the handle will be the sturdiest. After that, it depends on your needs. This is your basic paddle hoe. It has a 6-1/4" x 4-1/4" blade on a 52" wooden handle. The blade is attached via a goose-neck, for better alignment, making it easier on your back. Unless you are buying a higher end tool, you might prefer wooden handles because they have more give than fiberglass and are easier on your hands. With regular cleaning and oiling, they can last as long as fiberglass. Warren hoes have a triangular blade which makes them nice for tight spots. They can weed or cultivate under plants, without disturbing them. They also do double duty making furrows. This hoe is made by Ames/Truetemper. The blade is 4 3/4" x 6 5/8" with a 54" hardwood handle. The pinned chrome steel ferrule gives it added strength at the base. Onion hoes are long and thinner than basic blade hoes. The design is meant to make it easier to slide under foliage, but the width can be a problem in crowded beds. However, the extra with is welcome when weeding. Both the bottom and side edges are sharpened, for more versatility. This product is also manufactured by Ames Co. The blue square top blade is 7" x 1 3/4" and made of Chrome ferrule. It has a flame toughened 52" hardwood handle. Scuffle hoes have become my hoe of preference because they cut in both directions, backward and forward. The name is appropriate. You scuffle the blade along the soil, rather than pulling it repeatedly toward you, as with conventional hoes. If your soil is not too compacted, it also works well as a cultivator. A couple of the hoes shown here have replaceable blades, which is a nice feature for any tool you plan on using a lot. The Heart Hoe was developed by a gardener who didn't like the pulling action of a traditional hoe and wanted more function than a scuffle hoe. 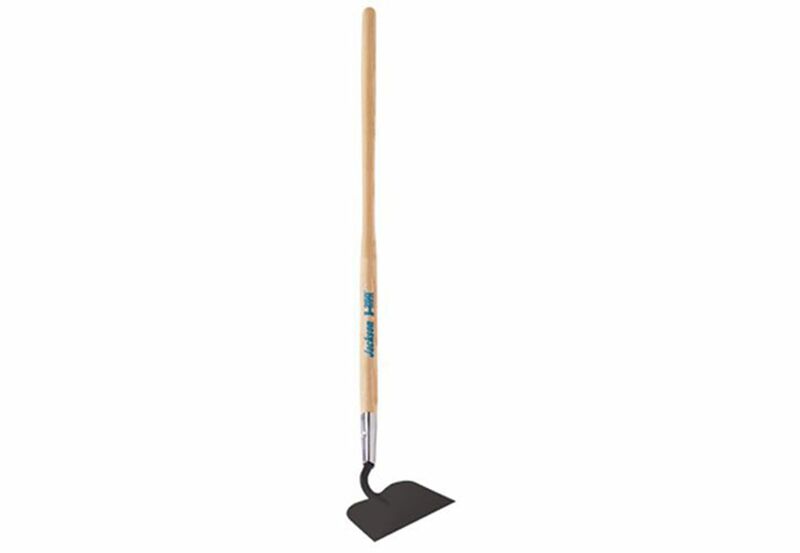 The Heart Hoe works like a scuffle hoe, for removing weeds, but it has a flat blade with a pointed edge, that can be used to cut into the sod. And the "V" groove at the top of the heart is used to yank out larger weeds. The hoe blade can rotate to any angle necessary. It's very thoughtful. There are other tools in the Disc-Hoe line, and they all have interchangeable blades and handles. There is both a long and short handle available.